While there is a lot of advice out there on putting your belongings into Doral self storage, you won’t find much in the way of safely and efficiently removing items from a storage unit. Here are some things to consider that we have found helpful when removing items. Before anything else, examine the unit. Items, such as stacked boxes, may have shifted in storage, or the person who loaded the unit may not have done so with removal in mind. When removing any item, make sure it will not cause anything to fall down and injure you or others. Test the weight of the things you will be removing—particularly those items stored in high places. Ask someone for help if an item is too heavy for one person to safely remove. 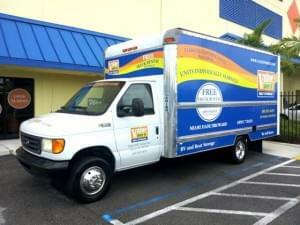 When you have larger items in self storage, arrange a truck for moving your items ahead of time. Moving requires manpower. Having a partner will help make the move go more smoothly, and may be necessary with large items. Identify exactly what will be removed from the unit and where they are located within the unit. Once you have opened the unit and confirmed the location of your items, set an order in which you will remove each item. If you are removing a lot of stuff, create different areas outside of the unit—one for trash, another for keeping, selling, etc. There’s no point in extending the process by removing and then sorting. Always keep safety in mind.